Since the mid-eighties, more audiences have been watching Hollywood movies at home than at movie theaters, yet little is known about just how viewers experience film outside of the multiplex. This is the first full-length study of how contemporary entertainment technologies and media—from cable television and VHS to DVD and the Internet—shape our encounters with the movies and affect the aesthetic, cultural, and ideological definitions of cinema. 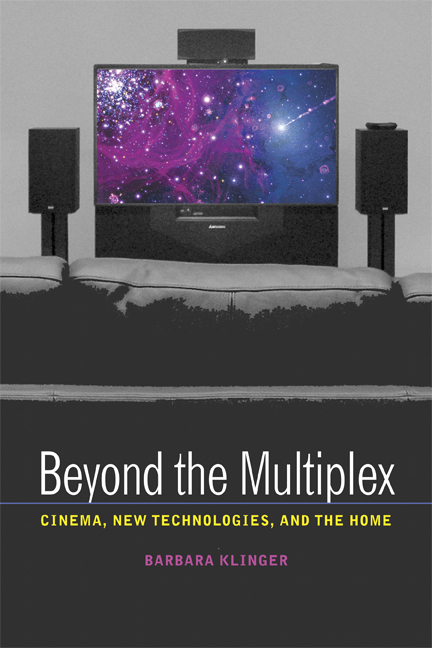 Barbara Klinger explores topics such as home theater, film collecting, classic Hollywood movie reruns, repeat viewings, and Internet film parodies, providing a multifaceted view of the presentation and reception of films in U.S. households. Balancing industry history with theoretical and cultural analysis, she finds that today cinema's powerful social presence cannot be fully grasped without considering its prolific recycling in post-theatrical venues—especially the home. Barbara Klinger, Associate Professor of Communication and Culture and Director of Film and Media at Indiana University, is author of Melodrama and Meaning: History, Culture, and the Films of Douglas Sirk (1994). Introduction: What Is Cinema Today?